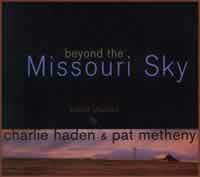 "Beyond the Missouri Sky, Short Stories"
I've been a Pat Metheny fan since the late 70's. The best man at my wedding, Doug, first introduced me to The Pat Metheny Group in 1979. I liked them so much, I asked Doug if I could borrow their self titled album and record it. At first he said no. He said it wasn't just me (yea right! ), he said it was because when he would lend albums out, they would either a.) not come back, or b.) they would come back scratched. Finally after some liquid refreshments (quite a few actually), I talked him into it, only having to promise the sole of my oldest daughter. Guess What? I scratched it. Yep, big as life. Well, being the person I am (and loving the thought of my first born remaining mine), I bought him a fresh copy. That scratched piece of vinyl still has a proud home in my collection. It's one of my favorites. As I do with every review, during my research on the artist I search the web looking for info. Little tidbits that (hopefully) you find interesting as you read these reviews. When I was doing my digging, I stopped by the PMG Listener Network site. Pat Metheny's Official home page. As I was browsing around the site, I was amazed at what I found. I know he's been around since the mid-70's, but did you know he's been nominated for 23 Grammy's? Did you also know that, of the 23 nominations, he's won 14 times? That's amazing to me. Here's a few more pieces of trivia. He has either scored, or his music has been featured in 15 films, he has received over 133 awards and has 31 music releases. Think about that for a minute. That is incredible! In the same vein, it's well deserved. This guy is an amazing musician. In this release, Pat Metheny joins with his long time friend, fellow Missourian (hey, I'm from Missouri too:-), and legendary bassist Charlie Haden. These two team up to create one of the smoothest Jazz albums you'll ever hear. This album won the Grammy for Best Jazz Instrumental Performance, Individual or Group. I'm not sure who the other contenders were, but after listening to the original compositions and this pairings interpretations of other composers work, I can see why they won. In regards to Pat's guitar, this album is mixed fairly well. Very clean, crisp yet lively and musical. If you're not familiar with Pat Metheny, he plays a variety of acoustic and hollow bodied electric guitars (generally speaking). He is an extremely talented guitarist and composer. The problem I have (and the only problem) is, they "juiced up" Charlie's bass too much. When they mixed it, somebody was really heavy handed. The bass is so overdone that I have to trim the gain to my amp that drives my woofers in order to listen to it. Even in my car, I have to turn the bass all the way down. I thought to myself, well maybe it will sound better (less boomy) on my small system with mini-monitors. Nope. Still too much. Oh, well :-( This is one thing I've noticed about Pat Metheny's recordings, there's not much consistency in the engineering. One album is just fabulous, like We Live Here, while another is iffy at best. OK, I'm done complaining, sorry. I think my favorite track is the ninth one, Johnny Mandel's, Moon Song. This song is so near perfection, it's scary (IMHO of course). Pat is playing lead on a really creamy sounding, hollow bodied electric. Playing, ever so lightly, over the top of that is Pat on a Manzer acoustic guitar with steel strings. Filling in on the lower end is Charlie adding rhythm, so expertly, on his upright bass, occasionally overdubbing for a stereo effect during a solo. All the while, an airy touch of chorusing from a synth plays in the background. Man, is this good! Track 7, Precious Jewel, is extremely good too. Please, don't let me scare you off with my engineer bashing. This album is truly wonderful. It has some really great music on it. I find myself playing it 2, 3, 4 times a week. It's that good, musically. It's WELL worth the $15 investment. What I ended up doing to compensate for the excessive bass was, I ran it through my mini-home recording studio and processed out some of the bass that shouldn't be there. It turned out OK, but I lost some of the music in the process. I just wish these engineers would listen to their finished product on a REAL stereo before they say "It's Done". It's all about the little details, guy's (speaking to the engineers out there). As always, there's lots of sound clips on the web if you are interested. Try the PMG Listener Network and Amazon for a quick listen.